Dr Roger Sexton AM (pictured left), Principal Patron and Chair of the Board of Patrons of the Freemasons Foundation Centre for Men’s Health welcomed more than 90 Centre members and guests to the Panorama Suite at the Adelaide Convention Centre on Nov 17 to formally celebrate the 10 year anniversary of the Centre and the unique research partnership between the Freemasons Foundation and the University of Adelaide. Dr Sexton acknowledged four people who were the masterminds of the Centre and who continue to support the FFCMH; Dr Greg Levenston, current Patron and former Grand Master of the United Grand Lodge of NSW jurisdiction, who travelled from NSW to attend the event, Sir Eric Neal AC former Governor of South Australian and inaugural Principal Patron, Robert Clyne OAM Executive Director of the Freemasons Foundation, and Professor Mike Brooks, current acting Vice Chancellor of the University. 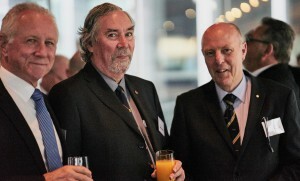 Also attending was Chairman of the Freemasons Foundation Inc, Mr Andrew Lathlean JP (pictured above with Richard Num and Robert Clyne) and Dr Vanessa Glennon, past Senior Executive Manager of the Centre who took the Centre from strength to strength, and also one of the Centre’s initial Fellows Dr Eleanor Need. Roger noted that since 2007, the Freemasons Foundation has contributed 3 million dollars to support men’s health research, the development of young and upcoming scientists and a program of public engagement; and investment matched 1:1 by The University of Adelaide. 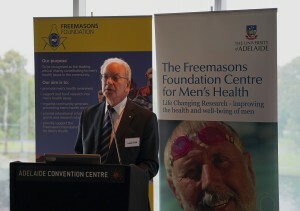 The South Australian and Northern Territory Jurisdiction of Freemasons has also provided considerable in kind support to the Centre over this period, and Roger thanked the Freemasons for their work behind the scenes fundraising in their communities to support the important work of the Freemasons Foundation and the Freemasons Foundation Centre for Men’s Health. 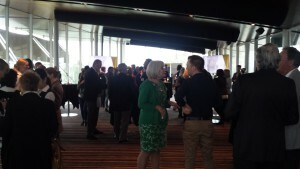 Dr Sexton went on to offer his gratitude to the University of Adelaide for the steadfast commitment to supporting the Centre, and more recently the South Australian Health and Medical Research Institute. The recently elected incoming Grand Master of Freemasons SA/NT and Patron of the Centre, Dr Neil Jensen then spoke to congratulate the Centre and The University of Adelaide for the milestone reached and, more importantly the impact it has made in men’s health over the last 10 years. Dr Jensen spoke about love and charity being at the heart of what it means to be a Freemason, and that the Centre is a proud example of this in action. As the incoming Grand Master, Dr Jensen who is a General Practitioner, said he looked forward to Freemasons SA/NT’s ongoing research partnership with the University and further building on the strong foundation set in the first 10 years. This entry was posted in Events, News and tagged 10 year anniversary, Freemasons SA/NT, funding partnership, men's health, milestone. Bookmark the permalink.